I am so frustrated! I have been trying al l afternoon to post some photos. The only one that finally posted was not supposed to be here in the blog but next door with my profile. Grrrrrrrrr. The book photos that were supposed to be here have disappeared into cyberspace - maybe they will return tomorrow like yesterday's photos that showed up today. Anyway, this profile photo is really of me - I think I was the only person in China with white hair. People stopped dead-still in the streets and stared at me. 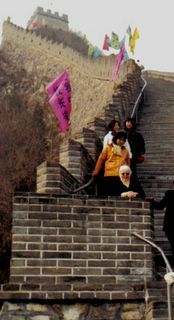 I couldn't figure out if there were no people in China as old as I am or if Chinese hair just never turns white, or what - but I was able to climb briefly on the Great Wall of China and a kind person took my photo to prove I was really there. Going up (and down) those steps was a real challenge - every stone step is uniquely sized - there was no way I could walk without looking at my feet and pulling myself up with the handrail. I felt really old and out of shape until I turned around and saw (younger) people behind me literally laying down on the steps out of complete exhaustion. It was really hard to imagine the soldiers who used to guard the Great Wall running up and down, shooting arrows over the battlements, etc. and not falling down. While I was in China, I wanted to see rugs being made, and I did - in a government store. The woman who was working on the rug worked at a stand-up frame that was more like a loom than not - it was warped with an uncountable number of threads - and she tied itty bitty knots that were invisible to the naked eye on each thread, in a row going across the rug. She said it might take some people a lifetime to make that kind of rug - and then I saw stacks of them for sale for bargain basement prices.